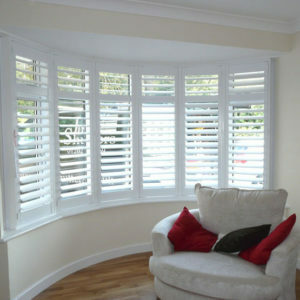 Introducing the perfect alternative to curtains and blinds – Potters Bar Plantation Shutters from Just Shutters. Tom Parrott is your local shutter expert. With decades of experience in his family’s Florida shutter business, Tom has been instrumental in all aspects of shutter design, creation and installation. Tom, now M.D of Just Shutters Hertfordshire, is committed to providing local homes and businesses, the very best of his experience. No dangling cords, no dusty fabrics taking space and light, no warping or bleaching! Just beautiful, stylish window coverings perfect for rooms large and equally small. For further information please book an appointment with your local Potters Bar Plantation Shutters expert on 01727 221298 or request a brochure here. Your choice of window covering can vastly change the look and feel of your room. With the largest selection of colours, styles and finishes in the UK we can make sure we create the perfect style shutter for you. Designed and made to measure for your window, every shutter is as unique as every customer. Colours and finishes – from pure white – light, bright and airy, to dark warm woods, and every exciting, bold, and neutral shade in between. We have what you are looking for. Bold statements? Special shapes? Or simple traditional bays… Let us show you how we can transform your room and match your style with our guaranteed shutters. Be inspired and view our extensive range of shutter images. Throw open your shutters and let the light flood in – perfect for opening up your room and making the very most of your view… Close them fully for an almost black out – perfect for a night in front of the telly, or a equally a great night’s sleep! Luxury does not always have to be expensive; we prove that you really can have it all with the UK’s best quality shutters at affordable prices. Just Shutters ensure that the value lasts and lasts, whereas curtains and blinds will need replacing when they tire, shutters come with a lifetime guarantee. For some added inspiration, visit our Plantation Shutter gallery pages to see existing installations, and do not hesitate to call on 01727 221298 or contact us via email with any questions or to book an appointment. Our customers are our pride and our mouthpiece. We believe that reputation and quality should be at the forefront of our company. As a result, we have gained an unrivalled reputation as the South of England’s premier shutter company! But don’t just take our word for it, see what some of our satisfied customers have to say – and check us out on check-a-trade. We have been awarded a 9.9/10 rating as a result of over 1700 unbiased reviews! This is our second use of Just Shutters. Very pleased overall – recommended to my sister. Fantastic, so pleased with product and installation. I would so recommend this company. Fit spot on plantation shutters to three rooms. So excellent from start to finish. If you are looking for shutters in Hertfordshire, shutters in Radlett, Potters Bar, Royston, Welwyn Garden City, or anywhere in the surrounding area, give Gene a call today!